For the past 100 years, this iconic hotel has played a key role in the life of Portoroz. With its authentic mix of Art Nouveau, Secession, Bauhaus, and Art Deco architecture, Kempinski Palace combines glamorous Viennese elegance with modern design. 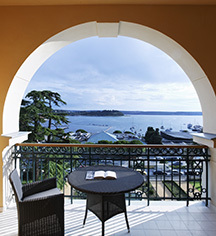 The Kempinski Palace enjoys a unique location in the very heart of Portoroz, with a fantastic view of the Adriatic Sea. The hotel is ideally positioned for leisure, business, and adventure. Elegantly nestled in a historical park, the luxurious hotel dates back to the Austro-Hungarian Empire in 1910. Behind its grand Habsburg façade, there is a unique blend of traditional and contemporary design. The hotel’s interior was designed by the Paris-based DESSEINS Interior Design Studio, with Jean-Claude Laville as the head designer. He has created a successful symbiosis of historic architecture in the Palace wing, and modern influences with the crown motif of roses in the new wing. The guestrooms and suites in the traditional part of the hotel have a vintage look, which is reflected in the furniture and warm colors. On the other end of the spectrum is the style of the guestrooms and suites in the modern part of the hotel, where every room has lively colors and a large picture of a rose above the bed. The Kempinski Palace Portorož is situated in the enchanting region of Istria, which attracts many with a wide variety of activities like yachting, sailing, scuba diving, biking and golf, in addition to cultural sightseeing and gourmet experiences with olive oil, wine degustations, and truffle hunting. 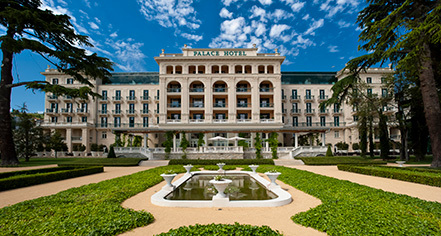 Kempinski Palace Portoroz, a member of Historic Hotels Worldwide since 2016, dates back to 1908. While presidential suites are usually located on the top floor, at Kempinski Palace Portorož, the presidential suite is located on the first floor of the hotel. When the hotel was first built, the aristocracy preferred to stay in the lower floors since the elevator had not yet been invented. Airport Transportation: An airport shuttle may be arranged through the hotel's concierge, EUR 145 per vehicle one way. Hotel/Resort Fees & Taxes: City tax of EUR 1.27 per person, per night (reduced rate for children under 18 years old). All reservations may be subject to additional taxes. Parking: Self-parking: Available; EUR 18 per night. Valet parking: Available; EUR 18 per night. Pet Policy: Service animals: Yes. Pets allowed: Yes, maximum one per room, EUR 30 per night. Rollaways: Available upon request; EUR 86 per night. Shuttle Service: Complimentary beach and casino shuttles available. Learn more about the History of Kempinski Palace Portorož .